Pan-African News Wire: Venezuelan Solidarity Conference Draws Over 400 Activists to Washington, D.C.
Venezuelan Solidarity Conference Draws Over 400 Activists to Washington, D.C. Originally uploaded by Jonathan Lawson. Venezuelan Solidarity Conference Draws Over 400 Activists in Washington, D.C.
WASHINGTON, D.C., March 6, 2006 (PANW)--In spite of the destablization campaign by the United States Government against the South American nation of Venezuela, support for the Bolivarian Revolution is growing internationally. This burgeoning support is also taking place inside the United States which was clearly reflected by the broad-based attendance at the "National Venezuela Solidarity Conference" held between March 4-6 at George Washington University. The conference attracted people from various regions of the country including California, Washington state, Detroit, Chicago, New York City, Washington, D.C. as well as Canada. The conference was co-sponsored by a host of organizations including the Alliance for Global Justice, the All-African People's Revolutionary Party, Artist Network of the Americas, Antonio Macio Brigade, Campaign for Labor Rights, the National Lawyers Guild, No War on Cuba Movement, Ocean Press, People's Hurricane Relief Fund, Rochester Committee on Latin America, the International Action Center, the Iranian Cultural Association, Inc., Latin American Solidarity Coalition, the Malcolm X Grassroots Movement, Hands Off Venezuela, Global Exchange, Global Women's Strike, National Immigrant Solidarity Network and many others. Venezuelan Ambassador to the United States Bernardo Alvarez Herrera opened up the conference on Saturday morning stating that he "has been here for three years, although it seems like ten." He thanked the conference organizers and participants for all of the work that is being done on Venezuela. "Some say everything was okay until President Chavez came to power," Ambassador Alvarez said. "However, despite this view, today there is an inter-American dialogue taking place where other nations in the region including Bolivia are taking part." Ambassador Alvarez continued by pointing out that "From the point of view of a government with a lot of enemies, the first thing that people in the United States must do is to adjust your lenses. The process in Venezuela is part of a historical movement, it is not an accident. For the last seven years we have opposed regime-change and the financing of opposition groups." Drawing attention to the positive initiatives related to support for the sovereignty of Venezuela, Ambassador Alvarez drew attention to the resolution introduced in the Michigan State Legislature by Representative Lamar Lemmons III of the 3rd District, which called for the United States Government to respect the independence of the country. This resolution was also signed by 14 other state legislators in Michigan many of whom were from the city of Detroit. Although the resolution was not passed by the Michigan State Legislature do to the political composition of the body, it was adopted by the National Black State Legislative Conference which encompasses officials from throughout the United States. This resolution reads in part that: "Whereas, Venezuelan President Hugo Chavez Frias won landslide presidential elections in 1998 and 2000 with 58 percent and 59 percent of the popular vote, respectively. These electoral victories signaled the end of a 500-year-old colonial caste system in which an oligarchy of the socially, politically, and economically advantaged exploited the majority population." The House Resolution No. 145 presented by Representative Lamar Lemmons III continues by stating that: "Whereas, All democratic countries must abjure any state-sponsored activities to destabilize Venezuela's economy and/or national sovereignty. Further, all public and private American-based entities are conjoined for the sake of international social order and domestic tranquility to vigorously oppose the unconscionable low-intensity war that is being waged against the people and national sovereignty of Venezuela since the inception of the Chavez Frias administration." According to Ambassador Alvarez, "this is important for the Venezuelan people to have good people to work with inside the United States. The keynote speaker for the conference on Saturday was Antonio Gonzalez, an influential leader in the Latino community in the United States and director of the Southwest Voter Registration and Education Project. Gonzalez raised the question of "[H]ow are we going to learn the lessons of past struggles to end intervention in other countries by the U.S.? He refered to the monumental efforts related to the Vietnam war, Central America and Southern Africa from the 1960s to the 1990s. Gonzalez described himself as a representative of the excluded communities in the United States. He stated that the situation of Chicanos in the United States was one of internal colonization. "Many people see the Latino experience as an immigrant issue," Gonzalez stated. "In part yes, it is an immigrant issue, however, it is also one of occupation." "My family was incorporated through force of arms in the southwest region of what is now known as the United States. Consciously or unconsciously people find the domestic situation as unpenetratable and devote attention to the international scene. Nontheless, there is no division between the domestic and the international situations and there should be no division of forces," Gonzalez emphasized. Gonzalez pointed to the grassroots efforts of the Latino communities in coalition with African-Americans in the United States to change local governmental structures. He also pointed to the labor struggles that took place two years ago to affect change in the health care sector where Latinos and African-Americans won a contract that impacted 70,000 workers. "We are working to take power," he said. "We followed the examples of African-Americans and were inspired by Malcolm X and Martin Luther King. African-Americans are always first in all things good in the struggle for social change. Our movement is not going to get smaller but better. The reality of the situation in the United States is that the national minorities are becoming empowered. We must view the situation in Venezuela within that context. Our struggle is not done, it is a lifetime struggle," Gonzalez continued. "The struggle in Venezuela is also one of inclusion because prior to the revolution most of the population was excluded. 80% were without power in Venezuela. This struggle was no different than the black struggle. These efforts reflect a broader movement throughout Latin America," Gonzalez declared. "Before the changes there was an 'elite democracy'. People in Latin America are ahead of the U.S. In Venezuela mass labor and peasant movements are taking the lead. Elections with mass participation are gaining results. We cannot go there and teach, but to learn. We need clear objectives and goals. We must build independent mass movements to prevent intervention in Venezuela," Gonzalez continued. "We should bring hundreds of thousands of Americans to Venezuela. We should bring people from Venezuela here to speak. The corporate media should not define what is happening for us. We have to become creative and innovative. I am optimistic about partnerships. This movement has to be independent. When windows are open we should go through them. We have to be organized, thoughtful and agile to strike," Gonzalez concluded. A panel discussion at the conference featured Jorge Guerrero Veloz of the Afro-Venezolana Organization. This organization supports the Bolivarian Revolution and is working to recorrect the historical problems related to the legacy of slavery and racism in Venezuela. Guerrero discussed the loss of historical memory related to the official histories of Venezuela. He also drew attention to the hostile position of the United States toward Venezuela since the coming to power of President Hugo Chavez in 1999. 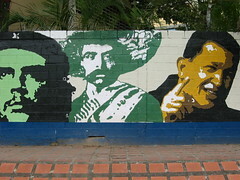 The Americans used Venezuela's close relations with Cuba and its support of progressive forces in Colombia as an excuse. "The National Endowment for Democracy (NED) supported the attempted coup in 2002, "Guerrero said. He pointed out that the United States Department of State continues to intervene in the affairs of Venezuela. "Secretary of State Rice said that the U.S. would finance strike action against the government, thus interfering in our right to have our own system of government. We are democratizing democracy. We are looking for solidarity with sister movements," Guerrero said. "We are providing heating oil to indigenous and African-American communities. Chavez has identified himself as an Afro-Venezuelan. The fight against racism is a major policy of the state,"Guerrero emphasized. Guerrero also pointed out the changes in the constitution which recognizes women as full citizens. President Chavez recently granted social security benefits and minimum wages to women who work in the home. Ministers in the government include both men and women. The vice president of the nation is a woman. Over thirty workshops were held at the conference. These dealt with issues such as Venezuela and the African Diaspora; US and Internaitonal Labor Solidarity; US Sponsored Coup D'etat: Haiti and Venezuela; The US War on Cuba, its Relevance to Venezuela and Regional Developments; Delegations to Venezuela; Citgo Buycott; Campus Organizers and University Resources; the film "The Revolution Will Not Be Televised" was screened; African-Venezuelans and the Bolivarian Revolution; Indigenous Rights in Venezuela and the Native American Connection; among others. Revolutionary Party and Pan-African Roots, Nellie Hester-Bailey of the Harlem Tenants Union and Dr. Alberto Jones of the Caribbean American Children's Foundation. The workshop discussed a draft resolution submitted by Bob Brown which sought to express unconditional solidarity with the Bolivarian Revolution in Venezuela. Brown, who has worked in the civil rights, black power, anti-war and pan-african movements for 43 years proposed the establishment of a new group called the People of African Descent in Solidarity With Venezuela (PADSV). Extensive discussions were held on the language of the resolution and further work will continue to refine the document and to circulate it internationally. According to Brown, some 30 organizations and individuals have expressed support for the effort. Nellie Hester Bailey, who has been active in the Cuba solidarity movement for years, recently attended the World Social Forum in Caracas, Venezuela in January. Bailey discussed the work done over the years in solidarity with Southern Africa and the need to develop ties with Africans in Latin America. "How do we build solidarity with peoples in the Latin America region is the purpose of this workshop," Bailey said. The workshop entitled: "Indigenous Rights in Venezuela and the Native American Connection" featured a panel of activists from various indigenous communities based in the United States and Canada. One of the key speakers in the workshop was Robert Free Galvan who is the Field Coordinator of the Tribalconnections.us. people of color. It also happens in so-called progressive movements and it is not valid." The panel on indigenous rights expressed support for the recognition of the rights of their peoples in Venezuela and Bolivia. They contrasted this process with the role of governmental funded structures in the United States and Canada which they feel are designed to further destroy Indian cultures and sovereignty. A workshop on organizing delegations to Venezuela presented various programs in the United States that provide study tours to the country. What was clear is that more and more people are interested in traveling to Venezuela to learn and to provide assistance to the process of nation-building and social transformation inside the country. On Sunday a planning meeting was held to develop strategies for building a mass demonstration in Washington, D.C. in defense of Venezuela and Cuba on May 20. The idea for the march was initiated by the National Network on Cuba and the effort has been endorsed by over 100 groups. Organizers are requesting that activists bring bus loads of people from throughout the country to participate. A call for more endorsements was also made during the meeting. The demonstration is scheduled to gather at 10:30 a.m. in Malcolm X Park and will proceed through the Latino and African-American communities to Lafayette Park. The main demands of the demonstration include: the lifting of the travel ban against Cuba; the ending of the blockade of Cuba; the normalization of relations with Cuba; Hands off Venezuela and the defense of Venezuelan sovereignty; the freeing of the Cuban Five political prisoners and the extradition of Luis Posada Carriles. Organizations and individuals wishing to endorse the demonstration were encouraged to e-mail their support to: May20@yahoo.com. This conference was the first movement-wide gathering in support of the Venezuelan process. Activists from around the country pledged to intensify their efforts aimed at defending the sovereignty of the country and to educate people throughout the United States to the dangers posed by the Bush administration in regard to its aggressive and hostile policies towards the Bolivarian Revolution.